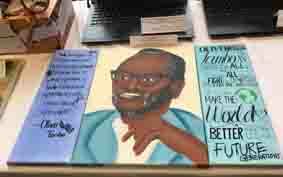 Congratulations to the students who won prizes and commendations in the ‘Make a Memorial to Oliver Tambo’ schools competition held to celebrate the centenary of Tambo’s birth in October 2017. The competition was organised by Park View School in Haringey, north London, in partnership with the Anti-Apartheid Movement Archive, Action for Southern Africa (ACTSA) and Brand South Africa. There were cash prizes for three age ranges: Key stage 2 primary school pupils (7–11); Key stage 3 secondary school students (11–14); Key stage 4 and 5 secondary/sixth-form college students (14–18). Entries included poems, paintings, sculptures, websites – and a board game. Oliver Tambo’s family lived in Haringey during their years of exile from South Africa. 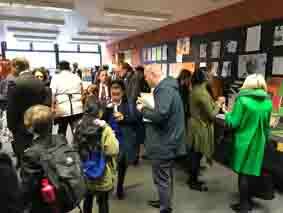 A prize-giving event was held at Park View on 2 November. The many diverse memorials were displayed with a ‘top table’ featuring the winning entries for the different age groups. Those present included former anti-apartheid activist and Cabinet Minister Peter Hain, Tottenham MP David Lammy and the Leader of Haringey Council, Claire Kober. The school’s Drama Group made a stunning music and drama presentation based on Nelson Mandela’s funeral eulogy for Oliver Tambo. Another student played his own keyboard arrangement of ‘Nkosi Sikelele’, South Africa’s national anthem. Special thanks to Lela Kogbara, Tim Spafford, Dan Lyndon and Martin Spafford for organising the competition, and to Brand South Africa for sponsorship. You can see more photos of the competition entries and the prize-giving on Park View School’s website here.